Lemala Kuria Hills Lodge is remotely located in the Wogakuria Hills of the Northern Serengeti. A scenic region characterized by grassy rolling hills, open woodland, and tree-lined watercourses, it is a habitat that attracts wildlife throughout the year. Lemala Kuria Hills is in close proximity to the Mara River on the Serengeti’s border with Kenya’s Maasai Mara, so is also within the main corridor of the world-famous wildebeest migration between July and October. Lemala Kuria Hills Lodge offers unrivalled luxury, Lemala Kuria Hills Lodge is situated in the Wogakurya Hills, close to the Mara River on the Tanzanian side of the border and within the main corridor of the world-famous wildebeest migration. Large boulders and kopjes form the prominent features of the site and each guest tent has been carefully positioned amongst these to ensure privacy and spectacular vistas over the gentle grassed slopes, open woodland and tree lined watercourses, which all make up the scenic north Serengeti landscape. Lemala Kuria Hills Lodgee has a clean and contemporary design that remain undeniably African at heart, largely through the warmth and vibrancy of the team that call it home. 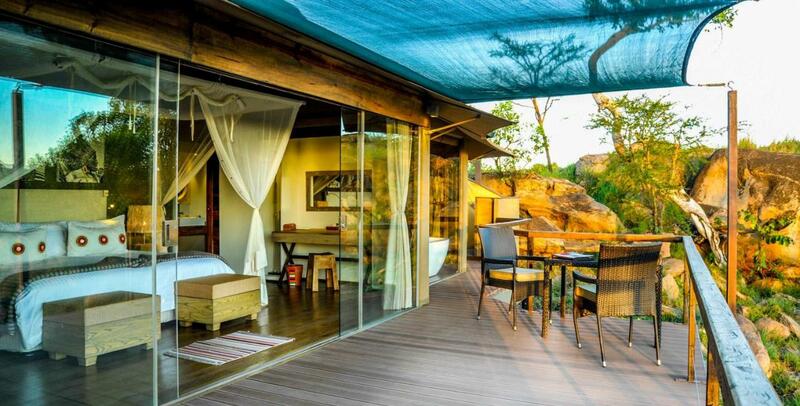 Lemala Kuria Hills has 15 spacious, glass-fronted tented suites that have been discreetly set amongst the giant rocks to ensure maximum privacy and spectacular views from the open decks. Each suite has an elegant and contemporary design, with comfortable, modern interiors enhanced by authentic African touches. The public areas are dominated by magnificent kopjes, and guests can enjoy the broad views of the grasslands from the bar, sitting and dining areas and swimming pool. Magnificent kopjes dominate the public areas Lemala Kuria Hills , with superb views from the bar, sitting and dining areas, swimming pool and the decks. Guests may enjoy several dining options in camp or out in the bush with a choice of freshly cooked starters, main course, desserts and house drinks. Tea is served in the afternoon before your game drive and cocktails at sunset on one of the kopjes overlooking the Isuria escarpment. There are several dining options at the lodge or out in the bush, and delicious meals include a choice of starters, main courses, desserts and house drinks. Afternoon tea is served before your game drive, and cocktails at sunset are taken on one of the kopjes with distant views of the Isuria Escarpment in the Maasai Mara. The Melengali Spa is in a separate tent where you can indulge in massages and manicures in a peaceful, natural setting.